This is our weekly climbing meeting in Protected content Come alone or with partner, we can see on the spot how do we split the group. Please stay committed if you signed in, or at least cancel your participation if you are not planning to come. Climbing is about trust. Belaying skills are essential if you want to climb with the partner. 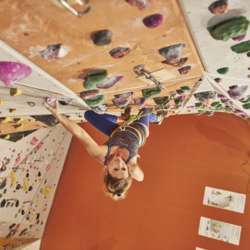 If you are new and "just want to have a look" you can do some bouldering. Don't hesitate to come, climbing is a cool opportunity to meet new people and have fun together!